The best thing to come out of New Zealand since Kiwis, Sandboards are up-and-coming superstars stamping their sound worldwide with an already huge not to mention well-deserved fan base in Australia & London. These boys are no strangers to heavy hitting heaters with previous records signed up to no other than FEEL MY BICEP, that alone should tell you everything you need to know about the powerhouse duo. They boast an impressive work rate holding down a residency on the infamous London-based Rinse FM, be sure to catch one of their shows. Moving nicely onto the great topic of Rinse FM, London-born and internationally adored they’ve grown into a huge music brand seeing them host radio shows, online TV series and run a successful record label diversifying across genres. 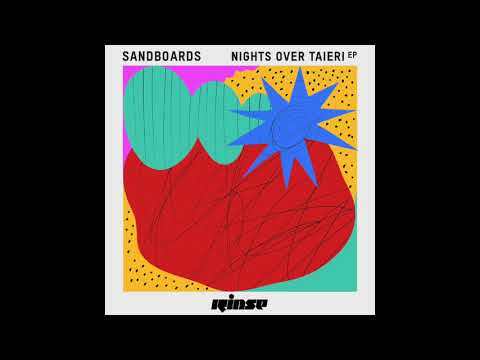 The next release comes from residents Sandboards with Nights Over Taieri EP. 4 beautifully crafted works of art come together to make up RINSE101, each track as different and unique as the next while still keeping that signature Sandboards sound to take you into a state of euphoria. Starting off the EP is ‘Nights Over Taieri’ with its driving gritty bassline accompanied by a fluttery haze of piano keys setting the bar high for the whole release. ‘Look Blue’ is the one to follow as what starts off with some simple yet effective drums twists and transforms into a cloudy synth driven masterpiece from heaven. Adding a unique vibe to the EP is ‘Steve French Theme’ a lovely roller with hidden influences of funk reminding us of Tiger & Woods it’s certain to hit any dancefloor hard. Last and most certainly not least comes our premiere ‘Go Purple’ bringing more euphoric emotion to an outstanding release. It easy to see why BICEP took such a keen interest in the duo’s production talents in past, a definite 2018 hit.